Hello and welcome to the 82nd installment of the SWD. Jaysh Idlib al-Hurr (Free Idlib Army) destroyed SAA‘s 23 mm gun position with a TOW missile somewhere in Al-Zahraa area, west Aleppo. Clashes reportedly erupted between Turkish-backed Free Syrian Police and Islamic State’s sleeper cells in Al-Rai close to Turkish border. The cause and outcome of the clashes are unknown for now. SDF and IS continue to clash for the fourth day in several districts north of Tabqa. SAA Tiger Forces and Qalamoun Shield Forces are reportedly being transferred from northern Hama towards Palmyra possibly for an upcoming long-awaited offensive aimed at lifting the siege of Deir al-Zour. IS’ SVBIED targeted Al-Rukban (Raqban) refugee camp in the vicinity of Al-Tanf border crossing not so far from Jordanian border. SVBIED detonated near the market and a pickup belonging to Maghwar al-Thawra fighters which have just returned from the front line, two rebel fighters were killed in the attack as well as two civilians. Rumors were spread about an additional IS’ improvised explosive device in the vicinity of Al-Rukban camp causing Maghwar al-Thawra to search for it around the camp. After the attack Jordanian warplanes flew over the area and civilians were asked to stay away from military installations outside the camp. 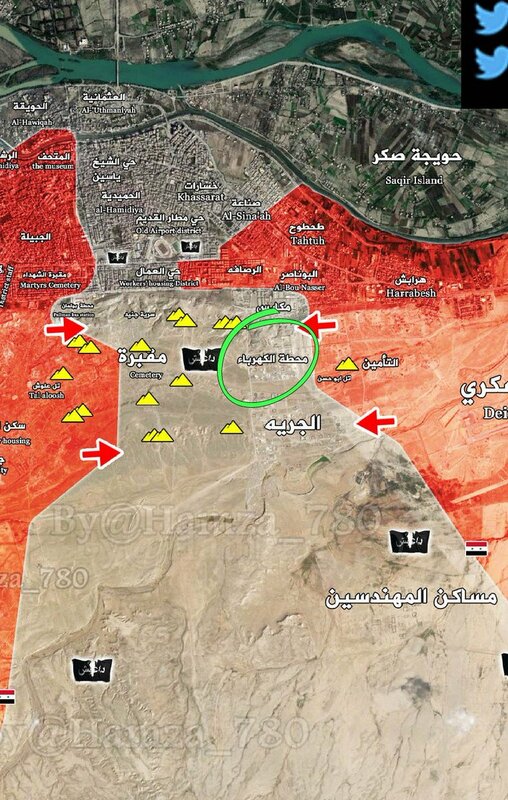 SAA captured Electricity Company from IS located between two SAA pockets in Deir al-Zour, after this advance IS’ southern supply route to Deir al-Zour city from Jabal Thardah has been cut. IS reportedly lost 13 fighters during this SAA advance. Rebels repelled the latest SAA attack in Qaboun pocket with Faylaq al-Rahman releasing footage showing one dead SAA soldier. Yesterday’s reports about Jaysh al-Islam fully capturing Arbeen were false as Falyaq al-Rahman and Hayaat Tahrir al-Sham captured it later from the former. 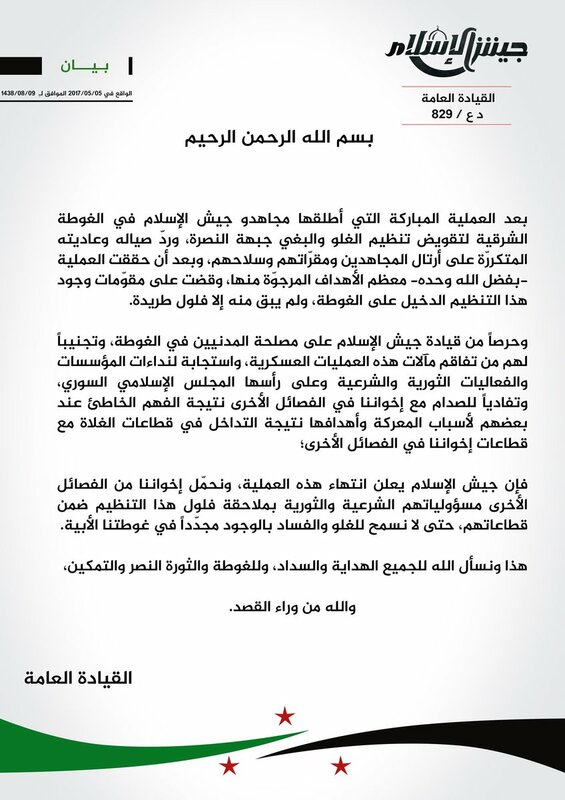 After these military developments Jaysh al-Islam released a statement saying that it is stopping its military operations against Hayaat Tahrir al-Sham as it has destroyed it leaving only remnants of it in East Ghouta. Another reason why operations are being stopped is because of civilian safety. Jaysh al-Islam has overestimated itself and underestimated Hayaat Tahrir al-Sham’s and Faylaq al-Rahman’s resistance and number of their fighters. Now that its core areas are being threatened Jaysh al-Islam is trying to save face by saying it has completed its goal and pretending to care about greater good, that being well-being of civilians in East Ghouta. If Jaysh al-Islam truly cared about civilians there wouldn’t be several incidents involving its fighters firing on demonstrations and in one instance actually wounding one of the protesters. Iraqi Army made new advances in northwestern Mosul, Army’s focus today was on Al-Haramat district and on remaining IS-held parts of Mushrifa district. During the clashes in Al-Haramat district where Al-Haramat Apartments were captured by the Army, more than 30 IS fighters were killed. Islamic State is still making a stand in northwestern Mosul with new suicide attack in Al-Haramat district destroying a Humvee, damaging a second one and a BMP as well as killing several Iraqi soldiers. In another statement Amaq claimed that IS’ snipers have killed 10 Iraqi soldiers on Mushrifa’s outskirts. According to Amaq Agency’s statement CJTF-OIR targeted a refugee camp for internally displaced people in Al-Fatah neighborhood, west Mosul killing 68 and wounding 86 civilians, out of 68 killed 48 are allegedly children and women. Peshmerga’s commander of the 5th brigade, Brigadier General Kawa Tawfiq was injured by an improvised explosive device that targeted his convoy near Al-Zarka village south of Kirkuk. IS’ SVBIED exploded in Haditha near civilians killing and wounding at least 11 people. Iraqi Army conducted a counter-terrorism raid in Abu Ghraib west of Baghdad infamously known for IS’ sleeper cells. Raid took place near the Tariq camp where three men were arrested on terrorism charges. Last night clashes erupted between two tribes in Basra governorate. On the 4th of May 2017 CJTF-OIR has conducted 28 strikes in Syria. CJTF-OIR‘s main focus in Syria at the moment is Tabqa-Raqqa-Deir al-Zour region where they did 25 strikes supporting SDF‘s operation against IS destroying five IS wellheads, three tunnels, an IS oil storage tank, a command-and-control node, nine fighting positions, four vehicles, two tactical vehicles and a vehicle-borne bomb; and suppressing an IS tactical unit. Other areas where three strikes occurred are Abu Kamal and Palmyra destroying a vehicle and three tunnels. Full report on CJTF-OIR strikes conducted in both Syria & Iraq can be found here.